AIR strikes are nothing new in North Waziristan. Terrorist hideouts in the largely autonomous region on the border of Afghanistan have long been targeted by American drones, which had been inactive of late because of Pakistan's insistence. This time, the hideouts are being targeted by Pakistan Air Force warplanes. 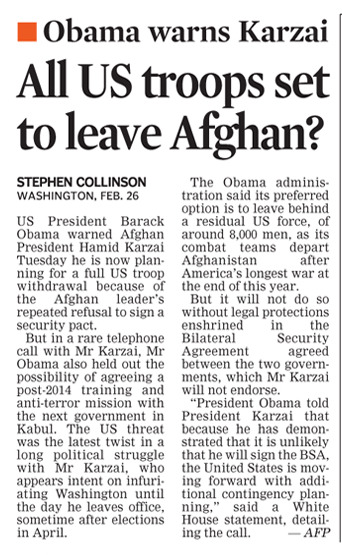 The army too, has announced that it is preparing for a big offensive, unless the Taliban come to the negotiating table. A change of heart can be perceived. 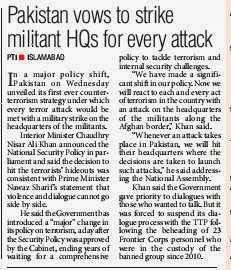 The federal government in Pakistan has approved a new national internal security policy with a tough stance against the militants. The policy, presented by the Interior Minister, Chaudhry Nisar Ali Khan, clearly enumerates the rise in the number of terrorist incidents in Pakistan as well as the cost of terrorism to the economy of the country, which it puts at $79 billion in the past 10 years. An unconditional ceasefire by Tehreek-e-Taliban (TTP) has been made a precondition for talks. Politicians have not only articulated their policy clearly, they have managed to evolve a consensus that will surely strengthen the hands of the Pakistani army in dealing with the situation. Patience in Pakistan was running thin following the killing of 23 captured Pakistani soldiers and a spate of recent attacks, including one on a Karachi police station that resulted in 19 casualities. There have been many false starts towards tackling terrorism in Pakistan. Unfortunately, Pakistan has also failed to realise that providing a base for terrorists within its borders has created a situation where it itself, and not just its neighbours, have suffered. 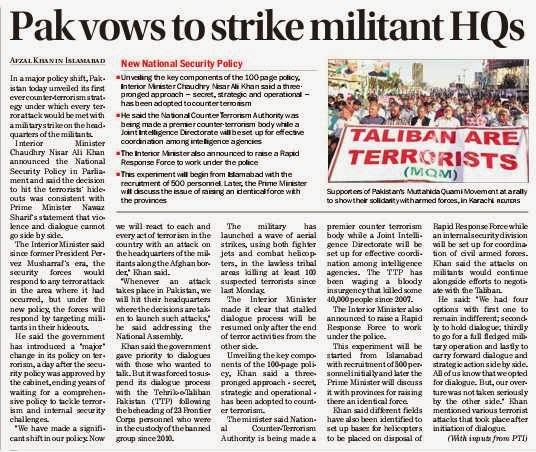 Taking a firm stance against terrorist activity and attacking terrorist bases will no doubt yield results, it will be some time before the effect is visible. A firm resolve and a clear vision can help sort out many situations. However, even with that the road to tackling terrorism is a long and arduous one, especially for Pakistan. 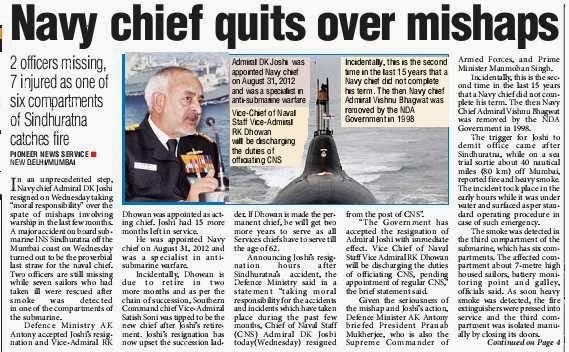 Navy Chief Admiral DK Joshi resigned following a naval accident involving submarine INS Sindhuratna this morning. His resignation has been accepted with immediate effect. 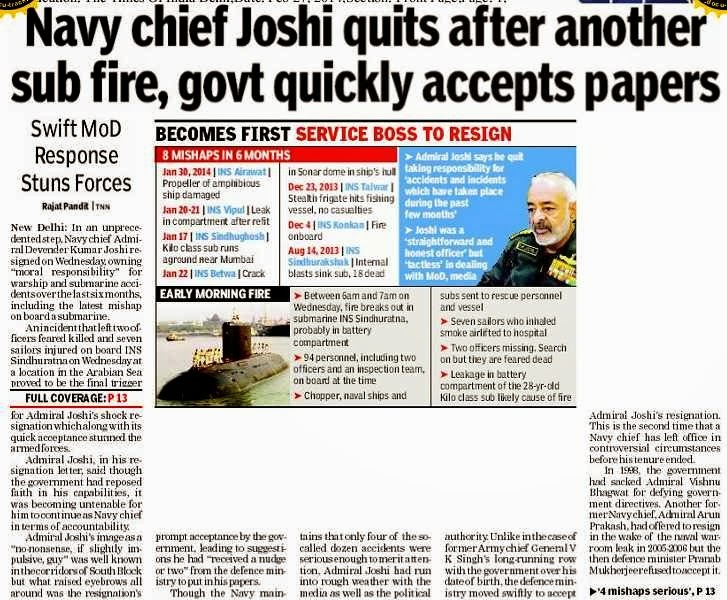 He is the first Navy Chief to quit the job. The only other time a Navy Chief left mid-tenure was when Admiral Vishnu Bhagwat was sacked on December 30, 1998, by the BJP-led NDA government for defying government orders. 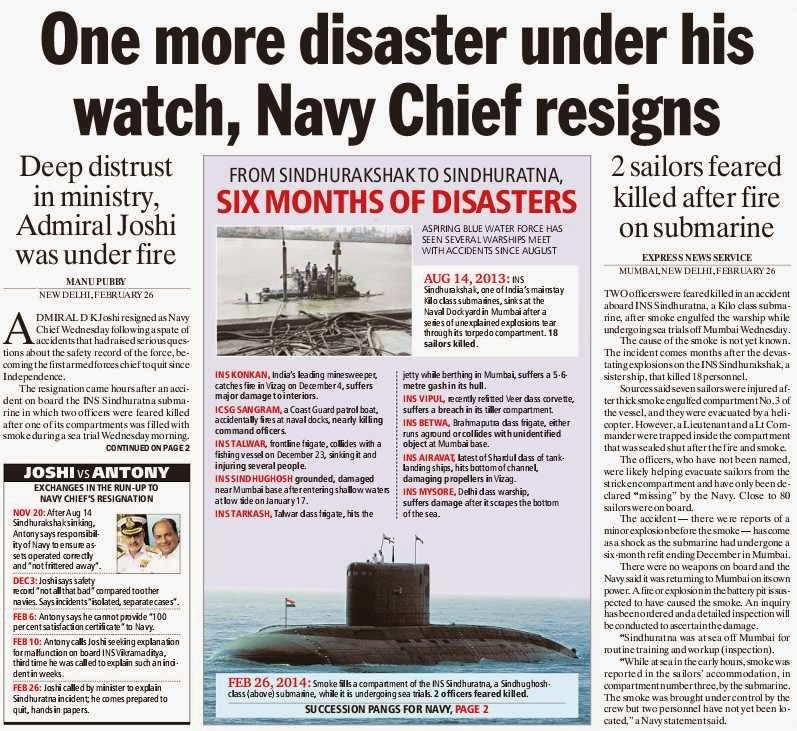 “Taking moral responsibility for the accidents and incidents that have taken place during the past few months, Chief of Naval Staff Admiral DK Joshi today resigned from the post,” Ministry of Defence spokesperson Sitanshu Kar said this evening. The government accepted his resignation with immediate effect. Vice-Admiral RK Dhowan would be the officiating Navy Chief, pending appointment of a regular Chief, the MoD statement said. Admiral Joshi, a specialised anti-submarine warfare officer, took over as the Navy Chief on August 31, 2012, and was to serve till August 2015. He was scheduled to take over as the Chairman of the Chiefs of Staff Committee (a body of three serving Chiefs) on August 1, 2014. Smoke was reportedly noticed in a section of Submarine INS Sindhuratna early this morning while it was around 100 km west of Mumbai. Deputy Electrical Officer Lt Commander Kapish Muwal and Watch Keeping Officer Lt Manoranjan Kumar, who went missing after the accident, are feared dead. Seven sailors, who had fainted due to inhaling of smoke, were airlifted using naval helicopters from mid-sea to the Mumbai-based naval hospital INS Asvini. The submarine surfaced immediately after the accident and the entire crew came out. Officials said the fire was in the third compartment of the 75m-long submarine. The 3,076-tonne, Kilo-Class vessel has six compartments. The compartment where smoke was seen was locked lest the fire should engulf the entire vessel. 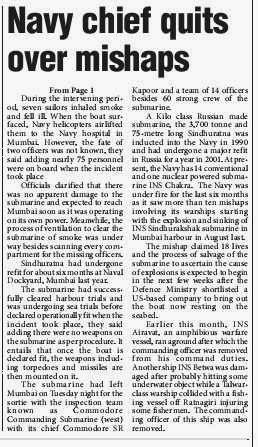 INS Sindhuratna surfaced immediately after the accident and the Captain did a head count-around 70 officers and men were on board. The submarine had just been refitted in India and was being tested out at sea for acceptance trials. It was not carrying any weapons or missiles. * While the government continues to repose its fullest trust and confidence in the service (the Navy), I consider my continuation as the Chief of Naval Staff untenable. Admiral DK Joshi’s sudden resignation from the post of Navy Chief has upset the line of succession in the force. Had he continued for his full tenure -- till August 2015 - Vice-Admiral Satish Soni, Flag Officer Commanding in Chief, Southern Naval Command, Kochi, would have succeeded him on September 1, 2015. Soni would have then been the senior-most officer. Though the government was careful to appoint Vice-Admiral RK Dhowan as ‘interim chief’, Vice-Admiral Sekhar Sinha is currently the senior-most officer in the Navy, with his retirement slated for October 31, 2014. Sinha is the Flag Officer Commanding in Chief, Western Naval Command, Mumbai. 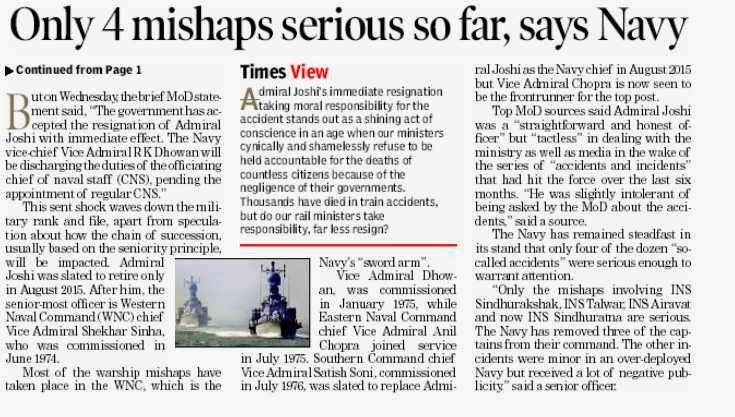 However, all accidents following which Admiral Joshi resigned occurred under Sinha’s command. Chiefs are appointed for a period of three years or till they attain 62 years of age, whichever is earlier. Vice-Admirals retire at the age of 60; hence age matters for officers to become Navy Chief. 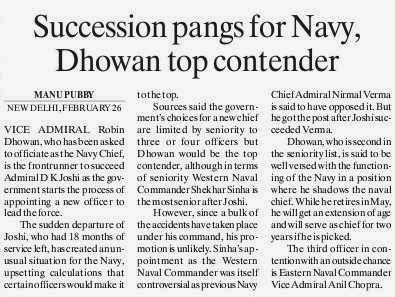 The second senior-most in line is Vice-Admiral Dhowan, who is due to retire on May 31, 2014. The third senior-most is Vice-Admiral Anil Chopra the Flag Officer Commanding in Chief, Eastern Naval Command, Vishakapatnam. He superannuates in 2015. Appointment of the Navy Chief is the government’s call. In the past, decision on a succession line in the armed force has occurred rarely since Independence. Lt General SK Sinha was overlooked to appoint General AS Vaidya as Army Chief and he quit. Admiral Bhagwat was sacked midway. Army Chief General BC Joshi died leading to the elevation of General Shankar Roy Chowdhry, the senior-most Lt General. 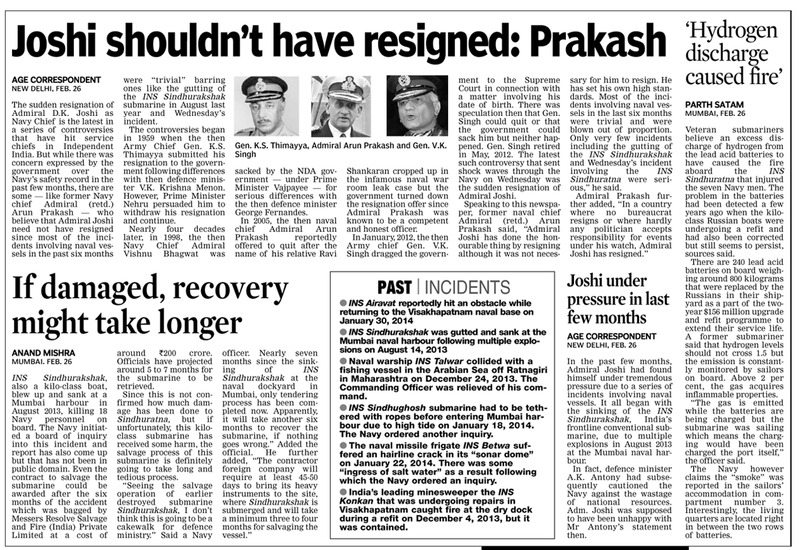 Though Admiral Joshi has gone down in history as the first Navy Chief to resign, Admiral Arun Prakash had in the past offered to quit, but was persuaded by then Defence Minister Pranab Mukherjee to stay. In the early 1960s, General KS Thimmaya quit but was persuaded by Jawahar Lal Nehru to withdraw his resignation. 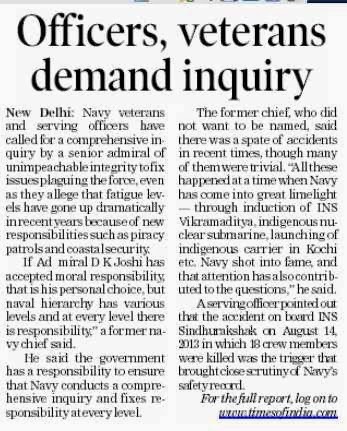 * Appointment of the Navy Chief is the government’s call. For Naval planners, the worrisome part is how China’s submarine fleet is four times the size of India’s. The latest accident means Indian battle-ready under-sea fleet is now down to 13. India had a fleet of 15 submarines, which reduced to 14 after the INS Sindhurakshak sunk. The vessel is yet to be salvaged. Today’s accident involving the INS Sindhuratna will mean the vessel remains out of service for a few months and needs extensive checks before it will sail again. It could take a few months. The US Department of Defence, in its annual report to the US Congress, spells out the rise of China’s submarine fleet. 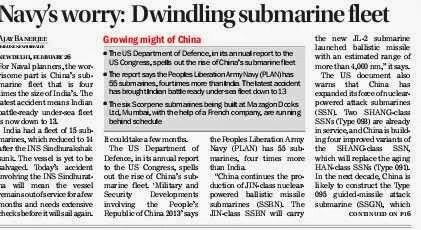 ‘Military and Security Developments involving the People’s Republic of China 2013’ says the Peoples Liberation Army Navy (PLAN) has 55 submarines, four times more than India. “China continues the production of JIN-class nuclear-powered ballistic missile submarines (SSBN). The JIN-class SSBN will carry the new JL-2 submarine launched ballistic missile with an estimated range of more than 4,000 nm”, it said. The US document also warns that China has expanded its force of nuclear-powered attack submarines (SSN). Two SHANG-class SSNs (Type 093) are already in service, and China is building four improved variants of the SHANG-class SSN, which will replace the aging HAN-class SSNs (Type 091). In the next decade, China is likely to construct the Type 095 guided-missile attack submarine (SSGN), which may enable a submarine-based land-attack capability. India, on the other hand, is in single digits. At the start of 2013 it had a total of 15 submarines, including the nuclear powered INS Chakra one leased from Russia. The six Scorpene submarines being built at Mazagon Docks Ltd (MDL) in Mumbai with the help of French company DCNS are running behind schedule. The first one will not be delivered before 2016. There has been no decision on building the next six submarines, a follow order to the Scorpene. There has been no decision to seek global partners, so far. * The six Scorpene submarines being built at Mazagon Docks Ltd, Mumbai, with the help of a French company, are running behind schedule. Around 1970, when Admiral DK Joshi -- then a young 16-year old -- was keen on joining the National Defence Academy (NDA), Khadakvasla, Pune, his mother Hansa Joshi expressed apprehension on her son joining the forces due to the ‘risk factor’. Today, more than 34 years later, her fears may seem prophetic as an unforeseen risk had led to her son quitting the post of the Chief of the Indian Navy -- the fourth largest navy in the world. Though Hansa Joshi had reconciled with the wishes of her son, Admiral Joshi -- with his resignation -- has today risen in the esteem of the men he commanded. Like a seaman, he has taken a straightforward call. 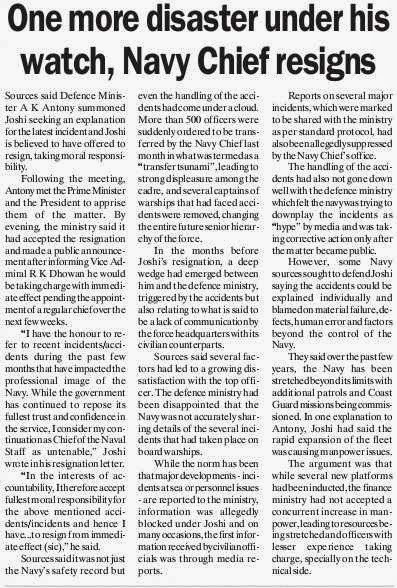 When he walked up to Defence Minister AK Antony at noon, Joshi was clear that he was quitting, and he made it known that he had to “resign with immediate effect”. In early 2010, the Admiral, then the Commander-in-Chief, Andaman and Nicobar Command (CINCAN), was tasked with the conduct of Exercise Milan which had a clutch of ASEAN countries which are locked in overlapping claims with China in the South China Sea. He went on to say that the Navy was holding exercises for such contingencies. “Are we holding exercises of that nature? The short answer is yes,” Admiral Joshi had said. Far away in Washington and Tokyo, his words were lapped up. Joshi, who was commissioned in 1974, was the 21st Chief of the Navy since the country’s independence. He is a specialist in anti-submarine warfare and has served in command, staff and instructional appointments. His experience includes a stint in warship production and acquisition as the assistant controller of the Aircraft Carrier Program (ACCP). He then worked at the “Operations Branch”, first as an assistant chief of naval staff (Information Warfare and Operations) and then as deputy chief of the Naval staff. 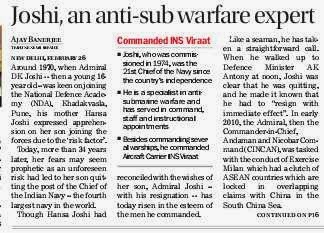 Joshi has been the commander-in-chief of the Andaman and Nicobar Command, the tri-service integrated command in India. A native of Dehradun, Joshi studied at Hansraj College in New Delhi. He graduated from the US Naval War College in Rhode Island and attended the National Defence College in New Delhi. Besides commanding several warships, he commanded Aircraft Carrier INS Viraat. It was a high tide at Noon that altered the course in the annals of the Indian Navy. 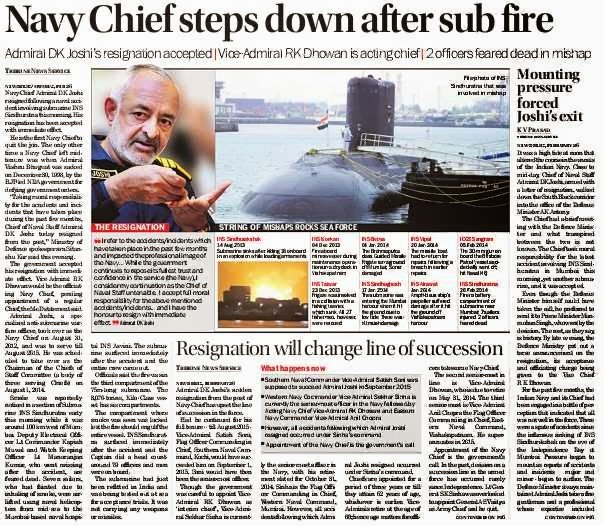 Close to mid-day, Chief of Naval Staff Admiral DK Joshi, armed with a letter of resignation, walked down the South Block corridor into the office of the Defence Minister AK Antony. The Chief had a brief meeting with the Defence Minister and what transpired between the two is not known. 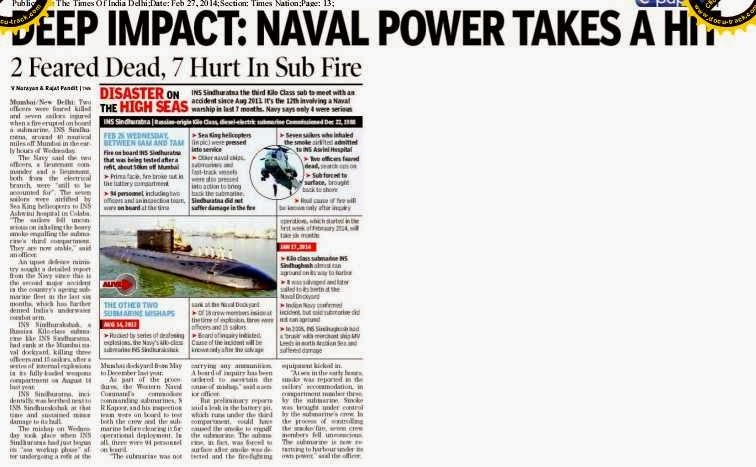 The Chief took moral responsibility for the latest accident involving INS Sindhuratna in Mumbai this morning, yet another submarine, and it was accepted. 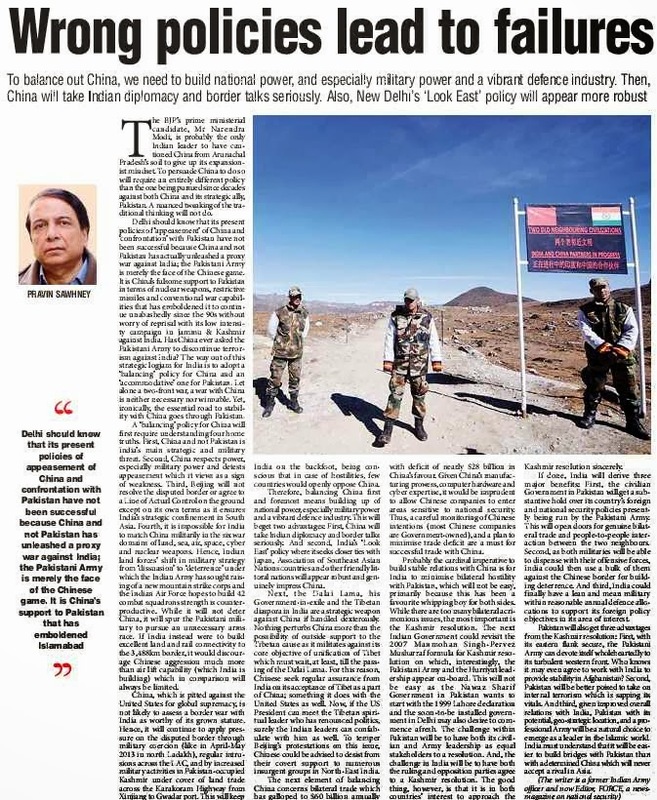 Even though the Defence Minister himself could have taken the call, he preferred to send it to Prime Minister Manmohan Singh, who went by the decision. The rest, as they say, is history. By late evening, the Defence Ministry put out a terse announcement on the resignation, its acceptance and officiating charge being given to the Vice Chief R K Dhowan. For the past few months, the Indian Navy and its Chief had been engaged in a battle of perception that indicated that all was not well in the force. There were a spate of accidents since the infamous sinking of INS Sindhurakshak on the eve of the Independence Day at Mumbai. Pressure began to mount as reports of accidents and incidents — major and minor —began to surface. 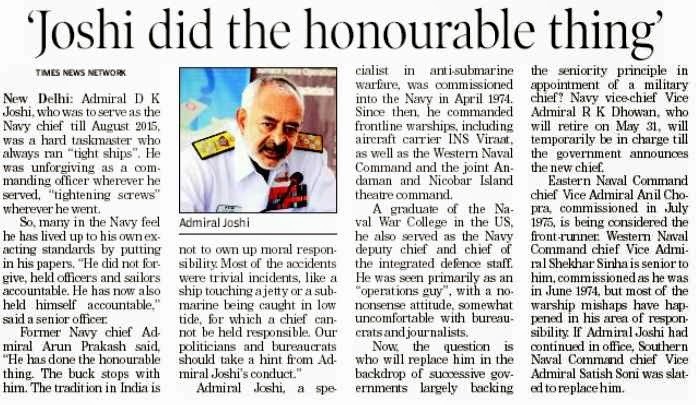 The Defence Minister always maintained Admiral Joshi to be a fine gentleman and a professional. Balasore, Odisha: For the third time in a span of five days, India successfully test-fired the indigenously developed surface-to-air missile Akash missile system from the Integrated Test Range at Chandipur in Odisha today. "Like the trials of the surface-to-air missile conducted on February 22 and 24, today's test fire of Akash was successful," a defence official said. These were part of a series of tests being conducted in various engagement modes from the first of Production Model system produced to equip two regiments of the Army, Directorate of Public interface, Defence Research and Development Organisation (DRDO) director Ravi Kumar Gupta said. Earlier tests flights, destroying a target in receding floating mode, as well as the one destroying an approaching target, fully met the mission objectives, a senior defence scientist said. Akash is India's first indigenously designed, developed and produced air defence system missile capable of engaging aerial threats up to a distance of approximately 25 km. The multi-target, multi-directional, all-weather air-defence system consisting of surveillance and tracking radars is designed to enable integration with other air defence command and control networks through secured communication links. Developed by DRDO, Akash is being produced by Bharat Dynamics Limited (BDL) as the nodal production agency with the involvement of Bharat Electronics Limited (BEL) and a large number of other industries. The total production value of Akash air defence systems cleared for induction by Indian Army and Indian Air Force is more than Rs. 23,000 crore. G Chandramouli, Project Director, Akash supervised the overall trial operations in the presence of senior army officials and officials from BDL and BEL.